"Newly knighted, Alanna of Trebond seeks adventure in the vast desert of Tortall. Captured by fierce desert dwellers, she is forced to prove herself in a duel to the death—either she will be killed or she will be inducted into the tribe. Although she triumphs, dire challenges lie ahead. As her mythic fate would have it, Alanna soon becomes the tribe's first female shaman—despite the desert dwellers’ grave fear of the foreign woman warrior. Alanna must fight to change the ancient tribal customs of the desert tribes—for their sake and for the sake of all Tortall." Boy does just the book blurb sum up for me what is far more problematic about this book to me now, than it was way back when! This is the book in the original quartet that I have the most mixed feelings about. It's in an awkward position between her triumphant reveal at the end of Book 2, and the climax of Book 4, and it feels that way. The plot feels muddled. Jonathon's a dickhead. I liked seeing Alanna as a teacher -- I think Pierce really likes writing about students and teachers in general -- but this very much feels like a rest stop on the way to somewhere more interesting. I really liked this book back when, and I still like a lot of things about it (Kourrem, you rock! ), but I have the feeling it would make me cringe to go back and read. 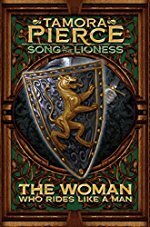 I’d like to see the “Woman Who Rides Like a Man” Tamora Pierce would write today (if she *would* write it), because while I think she has the start of a good book in the original, there are too many places that fall back on stereotype and cliche. Alanna is Mary Sue in this book in a way she isn’t in the other three. That all said, I’d read a quartet about Kara and Kourrem’s Shaman School written by a writer with Arab heritage in a hot second! Yeah, I always sort of forget about what happens in this book. The depiction of the Bazhir is ... rough. It is a little disappointing to go back and re-read the Alanna books after having re-read the Kel books so many times - like Alanna herself says, she's got the gods and her gift and she doesn't seem real and possible in the same way that Kel does. Or even Daine. This is one of my least favorite of Pierce's books. I really don't like how she depicted the Bazhir (full disclosure, I'm of Middle Eastern, although not Arabic, descent), and Jonathan regresses from a sympathetic, caring, dreamy first boyfriend to a selfish, immature jerk. I think it would have made a lot more sense to have him have to make a marriage for dynastic reasons, or for her to say, "You know, I just am not qualified to or interested in being queen." It's all hindsight, but that was annoying. I also never liked George all that much and was disappointed that Alanna ended up with him (both in this book and at the end of the next one) - and agree with everything everyone else said about the Mary Sue-ness. The Gift and the Gods are a bit much together, although Faithful was a witty and fun character. I liked this one as a kid, because it was Alanna striking out on her own, and I haven't read it in several years. I tried starting it this weekend, and it's excruciating. I like Alanna's buckle-down-and-take-care-of-business attitude, but.....yeah, the way Pierce writes about the Bazhir is just really painful. I know it's 30 years old but it has not aged well. I'd love to see how Pierce writes all the Alanna books now, but most especially this one! Jon is such a jerk in this book! I think it's important, though, that Alanna rejects the handsome prince to go off and find an adventure. That so wasn't a thing when this book was written, or at least not in the books I could find in the late 80s. I feel like the idea Alanna turning down the cute boy to go off and be a hero was really transformative for me. This has long been one of my favorites. I agree that it had huge problems, though. I think part of what I loved about it when I was younger, was that Alanna went from the magical medieval Europe that so many fantasies stayed in, into the rest of the world. She found her way into a magical Arabian community and got to know people. I wish that they were better written, but I'm glad they were written at all. I also like that we spend a fair bit of time with the apprentices just learning how magic works. And I finally start liking Alanna's love life. I think one of my favorite things is that she loves Jon, but doesn't want to marry him. It's not something you come across often. I also like how realistic it is that she goes to George for comfort, not looking for anything long term. And I absolutely love that at the end of the book she leaves to go adventuring, like she always wanted to. Follow those dreams!